For the longest time I thought my 'something blue' would be my shoes. After +/-5 hours of searching online and having to send some back from not being comfortable I decided to go to DSW. I found the Lulu Townsend Bridal Valissa Pump in silver. They met my heel height requirement of 3 inches and I was able to walk down the aisle without tripping! 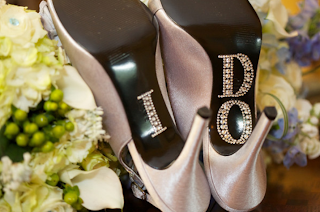 They are a satin shoe with a rouched satin overlay with a jeweled embellishment (perfect to match my dress!). I was willing to spend 100$ on shoes and was super excited that my shoes were only $49.95! Things to keep in mind when looking for your wedding shoe: Comfort, heel height, fabric (Silk or satin are traditionally the two most popular choices for wedding shoes), shoes to match your style and to try them on! 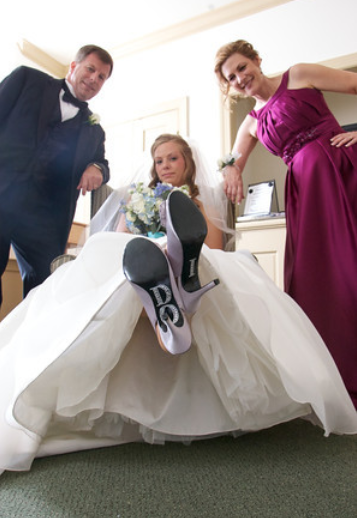 I added an "I DO" silver bling sticker on the bottom of my shoes, which made for some fun pictures! The stickers were less than 5$ total from AC Moore Craft Store. Remember you will probably only wear them once, but for 5-10 hours straight.